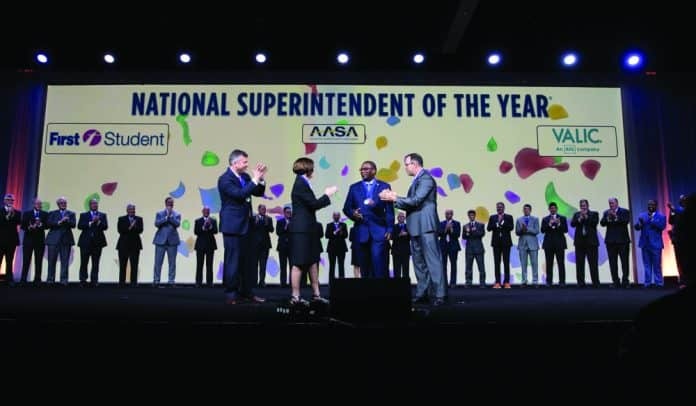 Curtis Jones, Jr. of Bibb County School District in Georgia won the 2019 AASA Superintendent of the Year Award. Trust is a two-way street. I uncovered this common thread shared by the finalists of the 2019 AASA Superintendent of the Year Award, which was sponsored by First Student and VALIC and presented in February. Now in its 32nd year, no award is more coveted by school administrators. Simply being named a finalist is a feat in itself. A board of experts judges the 50-plus state superintendents of the year who were selected by their state (or U.S. territory) superintendent associations over the past year and names four finalists for national recognition. With such a rigorous process, there’s no doubt they all are accomplished educators and administrators. Still, leading up to the National Conference on Education in downtown Los Angeles, I wanted to learn more about these superintendents and their direct impacts on student transportation in their respective jurisdictions. So, I reached out to all four school district transportation departments who work with Curtis Jones, Jr. of Bibb County School District in Georgia—who went on to win the this year’s award, and who graces this month’s cover along with First Student President Dennis Maple—Jeff Butts of Metropolitan School District of Wayne Township in Indiana, Mary Ann Ranells of West Ada School District in Meridian, Idaho, and Brian Woods of Northside ISD in San Antonio, Texas. The transportation leaders I spoke with all told me this winter that these superintendents keep a firm pulse on operations, yet they don’t micro-manage. While highly engaged and visible in their communities, they surround themselves with the best and brightest staff, as great leaders do. They challenge their staff with a long leash to be principled problem solvers. They demand accountability via a clear vision of what customer service to the community, parents and students looks like. They also trust that employees across all departments implement that vision accordingly and correctly. These values certainly extend to student transportation. They also command respect, which is seen no more clearly than with Jones, Jr., the former career officer in the U.S. Army, who you will meet this month, starting on page 38. The teachers and staff at Bibb County Schools had heard of his accolades before he joined the district four years ago. But as Director of Transportation Anthony Jackson told me, Jones soon proved to exceed any expectations by far. It helped that Jones had previous transportation experience, both in the military and at his former school district. Likewise, Brian Woods at Northside ISD in Texas was formerly the assistant superintendent who worked directly with Director of Transportation Rafael Salazar. Salazar said Wood is not only whip smart, but he’s also a man of character. It’s true what they say about “stuff” rolling down-hill. While they remain firm in their management, as Jones discusses later in these pages, these four superintendents demonstrate that great leadership ensures that gravity’s flow bears equitable, nurturing fruit for the betterment of the entire organization. That includes those who make the organization function well on a daily basis, and the children and parents they serve. Now, can you say the same for your operation and its leadership structure? Are you and your leaders earning trust or burning it? Editor’s Note: Reprinted from the April 2019 Issue, Editor’s Take.